The lush Hoh Valley has a reputation as one of the world’s spectacular temperate wet places, and more often than not it’s heavily shrouded in mist and low clouds that drift off the Pacific. Up-valley, that moisture replenishes the immense glaciers of the tallest peak in the Olympic Mountain range. Mt. Olympus receives on average up to 240 inches of precipitation a year. It may only be 40 miles from wave-pounded coast to icy summit, but this mountain is still mostly mystery to me. Enticing but faraway views from odd hikes on the periphery of the range are all I have to speak for. The Hoh River Trail leads to Mt. Olympus, but it’s 18 miles to the Blue Glacier. The Hoh rainforest valley is a compelling gateway, to say the least. The idea of a hidden, mysterious Mt. Olympus consumed me as Lance and I stepped out into clearings along the river for dramatic views upstream to heavily forested ridges. We saw a sliver of the Olympus massif in the form of stunning Mt. Tom, but even that disappeared as we rounded a bend in the river. We were swallowed up by the beautiful deep woods. I didn’t capture the lushness of the Hoh Valley on this sunny day, but the two forest pictures I sandwiched here are a couple of my favorites from “inside the woods”. Lance took a little more time here than I did (i didn’t even get my camera out for the first pass), I’m looking forward to seeing what he saw in his viewfinder. Unfortunately, we were rushed on the way back after getting held up by an elk traffic jam so we had very limited time to shoot pretty Mineral Creek Falls. 2.8 miles from the start of the Hoh River Trail, Mineral Creek Falls is a couple hundred feet above the trail and this bridge. I combined the creek, bridge and waterfall in a nice shot with my super-wide angle lens, but I was in such a hurry I didn’t realize the thin waterfall was blocked by a tree, hahaha! I was a little surprised- this 60 foot cascade was one of only two waterfalls we found on our exploration of the Hoh River Trail (an unnamed falls a long quarter mile up the trail looked interesting from a distance, but with a couple miles to go before Five Mile Island, not promising enough to warrant the short bushwhack). The valley is relatively broad here in the lower reaches. From Five Mile Island to the end of the Hoh River Trail, it might be a different story (my map shows all kinds of creek drainages, but who knows how far up them you might have to explore). The downstream view above is what a sunny day, thirty second exposure of the Hoh River looks like. I didn’t have the idea to slow this scene until Lance joined me (he had been on the bank across from me, fully prone and trying to capture a mushroom) and said he was going to give it a try. I wish I could have loaned him one of my ND filters, but our lenses are different diameters. He had to stop his camera at f32 to get the effect he wanted. I put a ten stop ND on and a CPL and was able to shoot f10. I chose f10 because it was a breezy day along the river and I knew nothing but the rocks would come out sharp. It was an interesting experiment. As you can see, the first couple miles of the Hoh River Trail were pleasant and offered a rousing sneak preview of what was to come. Numerous, gargantuan colonnades stood sentry along the path (colonnades are giant nurse logs straddled by the roots of equally enormous living trees). And ever-present from the time we stepped foot on the trail, the enduring symbol of the Hoh rainforest: the spectacular epiphytic growth (things like witch’s hair and licorice fern matting seemingly every square inch of some trees). 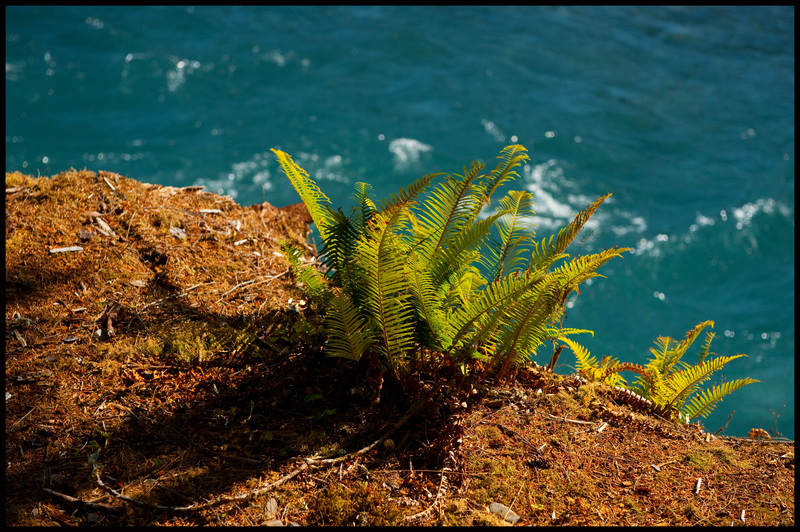 We saw ferns 200 feet up in the air. Not that I haven’t seen all this before. As we hiked through the woods and squinted up at the bright sunshine beaming through the canopy high above, I was reminded of the lushness of the Middle Fork Snoqualmie Valley closer to home. The dramatic difference being, of course, that the Hoh rainforest is a purer ecosystem, ancient woods marvelously intact. I already alluded to this, but my only real disappointment of the day (other than having to leave) is that I didn’t really capture any of the ethereal arboreal setting. If there’s one place you can visit to do nothing but shoot the beauty of the forest, the Hoh makes it easy. The bright sun streaming into the woods made for an exposure nightmare. That’s why we focused on backlit scenes and pleasant bankside shooting at first, it was the easy way. After shooting along the rocky bar with the riffles, we picked up the pace a little. 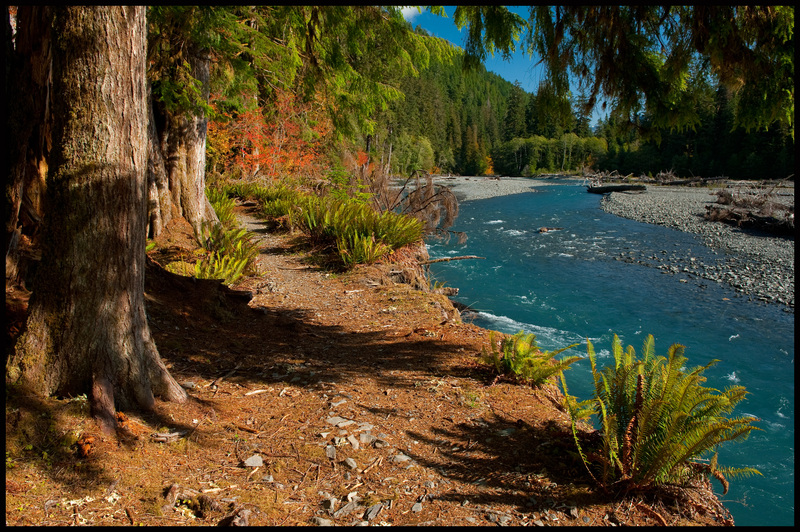 The Hoh River Trail meanders away from its namesake and into the forest, at times. You’re nearly always in sight of something soggy, though. Lance and I appreciated the angular footbridge (in the picture below) over Mt. Tom Creek (which has its headwaters on the White Glacier, between Mt. Olympus and Mt. Tom), it’s banks lined with wavy, hair-like grass floating in the trickle of water. Eventually Mt. Tom Creek spills into the Hoh River. I love taking pictures of bridges along the trail and we stopped for a few minutes on our way back. I felt like I could keep walking and walking and walking. I was a little bit worried about Lance because the night before he had come down with a bad cold and all day long I felt as though he was walking faster than me in an attempt to compensate for not being a hundred percent (and for what he perceives as his slowness compared to me). He’s faster than he thinks, and really…. I’m very slow when I hike with others (which is not very often). I love a social pace. And it behooves me to keep from sweating all over my hearing aid. A few days earlier I hiked 3,600 feet seemingly with ease, but the comparatively gentle Hoh River Trail still seemed to require a certain amount of effort. After a mile and a half, there is some upsy-downsy. It was a scant mile to reach the pleasant bottomland (and the 5.3 mile mark) at Five Mile Island when we crossed the bridge here. I felt fine, but I was hungry and tired of peeing. There’s a reason they call it a rainforest. To lighten my load, earlier I drank a quart and a half of water while I was resting and watching Lance shoot Mineral Creek before it cascades into the Hoh. Below is another picture of that little rocky bar we shot from in the morning. I know this is a goofy-looking picture, but sometimes I like showing where I was for context. That’s Lance out there trying his hand at a long exposure of the riffles. It’s where my long exposures came from, too. We just barely got here in time to eke out a few nice images. I resorted to splashing water on the rocks. The river rock in the Hoh get all silty from the glacial-run off and turn gray and white when they dry out. For someone with an obviously not-very-adjustable tripod, Lance got probably the best picture from the rocky bar, in my opinion. If I could do it over, I wouldn’t have kept my shutter open so long. We arrived past the peak color period for the big maples (most of their leaves were already crunchy and brown under our feet) but the low-angle autumn sun was so intense along the river that it’s warmth and the occasional glimpse of shock-orange vine maple combined with silty-glacier blue of the river had us trading oohs and aahs. There are many scenic but undermined spots along the banks of the Hoh where you have the feeling you may be five pounds over the safe weight limit for that patch of ground. This river changes shape often. The banks and rock bars are littered with miscellaneous detritus and enormous heritage trees that finally could not hold on any longer. The pictures of the river here are also where we first spotted the couple from Oklahoma making out, we kept running into them being amorous. There’s the mile-high club and there’s the Hoh Rainforest club, Lance and I had numerous laughs at their expense (alas, we hiked out with them at the end of the day and it was enjoyable). At Five Mile Island, we sat in grass and crunchy leaves along the river and admired Mt. Carrie with its fresh dusting of snow. All around us, leaves fell like giant snowflakes. My cheese and crackers tasted unusually good and so did the chocolate chip cookies Adam and Diana baked the night before. Lance day-dreamed about Lake LaCrosse and O’Neil Pass. Neither one of us was ready to leave but there were only a couple hours of light left and 5.3 miles to cross and who-knows-how-many-pictures to take, so after Lance took some pictures of High Divide, we set out for the return back to the trail-head. En route we were waylaid because of a big bull elk hogging the trail, which was more than fine with us as we watched him and his harem of more than a half dozen munch in the moss in a woody low glade a half mile down the trail from Mt. Tom Creek. I was excited for Lance because from the very beginning, earlier in the week, he had talked about how much he would love to see elk along the trail. And boy did he get to see. I didn’t get any good pictures of the bull. I was too worried about being gored to get my telephoto zoom out quickly enough. I got some good pictures of Lance taking pictures of the bull, though. What a great day! You really captured some beautiful shots—the shot of Mineral Falls with all that silky goodness and green moss is just spectacular! I love your narrative—really felt like I was there you both. Fantastic write up and images Jason! I too felt like I was there with you, which on his foggy Monday morning is a most welcome feeling. Good work!